Save a minimum of 50% compared to on-site SeaTac airport parking . Covered drop off and pick up area. Valet baggage handling on and off the shuttle. Four convenient locations, easy exits off freeways. 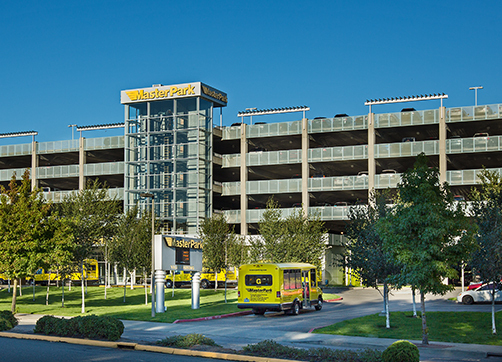 We're the closest valet parking to SeaTac airport entrances, and have over 5,500 parking stalls. Continuous SeaTac airport shuttle service 24 hours a day, 365 days a year - ready to depart when you are. The largest shuttle fleet serving SeaTac Airport travelers. Our ExpressPay program will help you save both time and money on airport parking. Secure paved lot locations, with on-site staff 24 hours a day. All locations are video monitored and are enclosed by high security fencing. Simply fill in the Enrollment form to submit your company's information and upon approval, your Corporate Card will be on the way to you.